1. 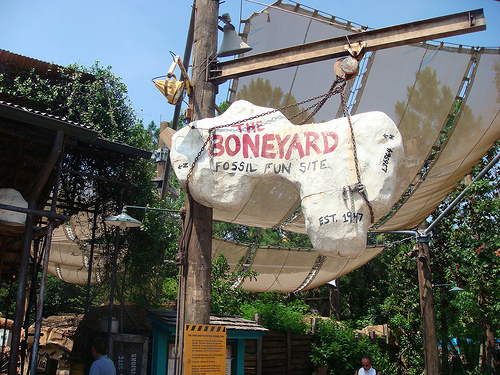 The Boneyard-Interactive childrens playground (similar to the Honey I Shrunk The Kids at Hollywood Studios). Children can discover the bones of T-Rex and Triceratops. There are many kid sized features and parents may not be able to follow children everywhere. It can get very hot in the afternoons so I recommend going in the morning. 2. Affection Section-Petting Zoo featuring sheep and goats. 3. Festival of the Lion King-This is a must see 'Broadway' type production of the ever popular Lion King! Children of all ages love this show, but arrive early (at least 30 minutes) to avoid waiting too long. The show takes place in an air conditioned theater, perfect spot to nurse a baby. 4. Finding Nemo-The Musical-30 minute adorable show featuring Nemo of course! There are puppets, dancers and acrobats featured that tell the story of Marlin and Nemo. A must see for children of all ages. 5. Primeval Whirl-Great 1st roller coaster for children who are tall enough to rdie. Guests must be 48' to ride this. *This is a tight squeeze for anyone who is Pooh sized* Fastpass is available. 6. Kilimanjaro Safari-This is a must see safari ride, but be warned the ride is extremely bumpy. 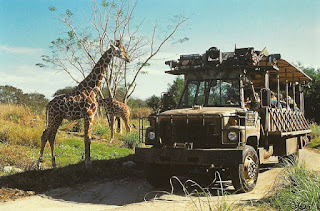 (Fastpass is available and is a MUST) I recommend doing this first thing in the morning as I have heard that the animals are more active early in the morning. You will see all sorts of animals including giraffes, elephants, pink flamingos, hippo's and rare okapi. 7. Triceratop Spin--Very similar to Dumbo except you are riding in a cute little dinosaur. 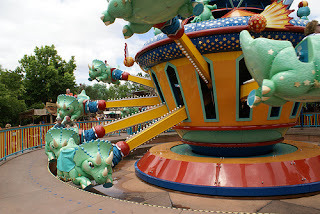 Each dinosaur holds 4 people as you fly up and down and all around. Great ride for all ages. 8. It's Tough To Be A Bug--Caution! This show can be scary to little children as there are certain scenes that may scare them (spiders, loud and dark etc.) Guests are given 3D "bug glasses" to wear during the show. The characters from It's A Bugs Life are featured in the show. Located inside the Tree of Life. Don't forget about the Character Greeting Trails where you can meet Minnie & Mickey Mouse, Pluto, Goofy, Pooh and Tiger, Rafiki and and Terk. A great time to go is during the Festival of the Lion King show because it is less crowded at the trails.